finally makes its Melbourne debut! Indulge your inner (or not-so-inner) nerd with the award-winning smash hit of 2011 Sydney Fringe, LadyNerd – Keira Daley’s funny, fact-packed cabaret tribute to some of history’s brainiest ladies, from Marie Curie to Ada Lovelace… via that woman who invented Liquid Paper. Following her epic World Nerdination Tour – with two seasons in Sydney, followed by Brisbane, Adelaide Cabaret Festival, the almighty Edinburgh Fringe as part of The Best of Sydney Fringe line-up of award-winning shows, and one last show in Sydney for good measure – Keira finally lands in Melbourne for a round of geeky goodness! Rockin’ smash hits and 90s-inspired originals rumble with a LadyNerd’s true tales of teen dorkwardness and triumph in the era of parachute pants and grunge. Stop, collaborate and listen – Keira’s back with a sparkly new follow-up to her award-winning solo debut smash-hit, LadyNerd. This time, she sings an ode to her favourite era of music while delving into the deep, dark, cringe-worthy recesses of her journals, circa 1993-1998. Tied together with awesome alternative tracks, KDV90s is a mega-mix of cringe-worthy crushes, bully battles, and alleged psychic super powers. returns to Sydney for ONE NIGHT ONLY! So many shows, how do you pick? Start with your delicious FREE tasting plate of the best music, musicals, cabaret, and more at the Fringe. 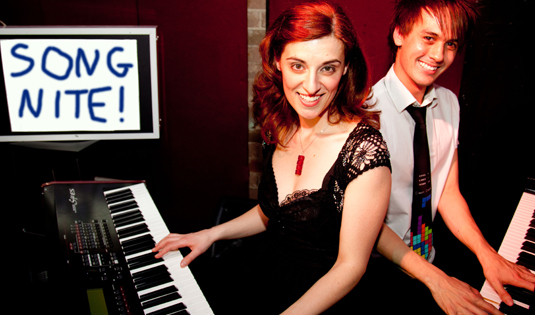 Cut loose with your host, Keira Daley (LadyNerd, Keira Daley Vs The 90s), and your “distractingly pretty” pianist, Mark Chamberlain, for some toe-tapping, head-bopping, rollicking variety night mayhem. Warning: Dangerously catchy. Slapdash Song Night! is a shambolic, fun, upbeat musical variety show featuring acts from the 2013 Sydney Fringe program. As well as a whole lot of live music, this special event has a talk-show element, so you audiences can get to know the artists. Featuring the quirky wit of host Keira Daley, and the cool musical savvy of pianist Mark Chamberlain (Jersey Boys, Mornings With Kerri-Anne), the action takes place in the glorious Eliza’s Juke Joint at 5 Eliza St Newtown – which brings a touch of old-timey saloon to the inner-west. The atmosphere is ripe for mischief, the drinks are flowing, and Slapdash Song Night! ties it all together in one very entertaining, slightly rowdy, bow. It’s the place for artists and punters to meet and mix with the motto: “singy-sing, talky-talk, drinky-drink” – the true spirit of cabaret! We hope to see you along at one or all of the things!